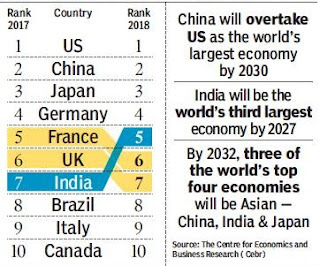 India is set to emerge as the world’s fifth largest economy by overtaking Britain and France. And, India will emerge as the world’s third largest economy by 2027, the report by the Centre for Economics and Business Research said. “The World Economic League Table shows that despite temporary setbacks from demonetisation and the introduction of the new GST, India’s economy has caught up with that of France and the UK and in 2018 will overtake them both to become the world’s fifth largest economy in dollar terms,” Cebr deputy chairman Douglas McWilliams said. “On some cost of living adjusted measures India is already the world’s third largest economy, but 2018 is the first time the Indian economy has caught up and will overtake both those of the UK and France in real money dollar terms,” said the 9th edition of the World Economic League table, which tracks the size of different economies across the globe and projects changes over the next 15 years. The Indian economy is emerging from the impact of demonetisation and rollout issues linked to GST. Latest data shows the economy grew 6.3% in the July-September quarter, rising from the three year-low of 5.7% growth registered in the June quarter. Several multilateral agencies expect the Indian economy to post robust growth in the years ahead and the International Monetary Fund forecasts the economy to expand by 7.2% this year and 7.7% in 2018-19. The report said China will overtake the US as the world’s largest economy by 2030. “This remains a remarkable achievement from an economy that was only 12% of the size of the US economy as recently as 2000,” it said. The main theme of the report is that emerging economies catch up and overtake advanced economies, using GDP measured in dollar terms. “The interesting trend emerging is that by 2032 five of the ten largest economies will be in Asia while European economies are falling down the ranking and the US losing its top spot,” said Oliver Kolodseike, senior economist at Cebr. “Technology and urbanisation will be important factors transforming the world economy over the next 15 years,” Kolodseike said.